Treves would become Merrick’s caregiver for life, and the two would form a bond far surpassing friendship that would be forever told in this moving story of survival against overwhelming odds. 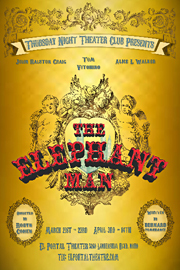 Thursday Night Theater Club is proud to present one of the most important plays of the second half of the twentieth century, The Elephant Man, a play by Bernard Pomerance, directed by Robyn Cohen at The Historic El Portal Theatre. * Select dates have an accompanying reception after the show; includes private viewing of 1 of 4 existing replicas of John Merrick's skeleton, authentic correspondence between Dr. Treves, and other authentic artifacts. Price: $20.